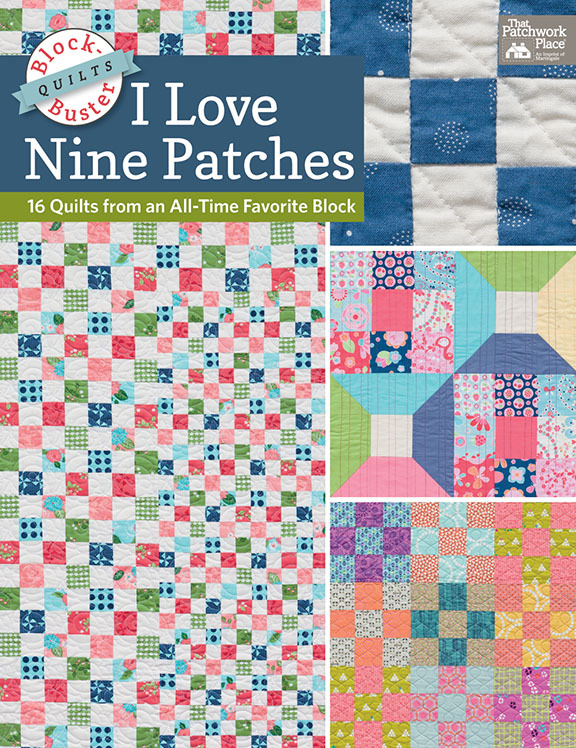 New Book - I Love 9-Patches - Coming Soon! Carol Kuse - I am starting EPP also, and look forward to using a glue pen. Thank you for the interesting blogs. Glad you enjoyed learning about some of my favorite notions. We'll have more online in the near future. I'm delighted to be part of another group of talented designers who were asked to participate in this fun book of projects by Martingale. Everybody loves 9-patches because of their simplicity, but also because of their versatility. So many great ideas jammed into one book! Other designers contributing to the book include Sherri Falls, Kimberly Jolly, Tammy Vonderschmitt and Kari Carr. I designed my 9-patch quilt last summer during baseball season as my husband was glued to the TV watching the Kansas City Royals. They were having a wonderful year and excitement was building as the summer rolled on. 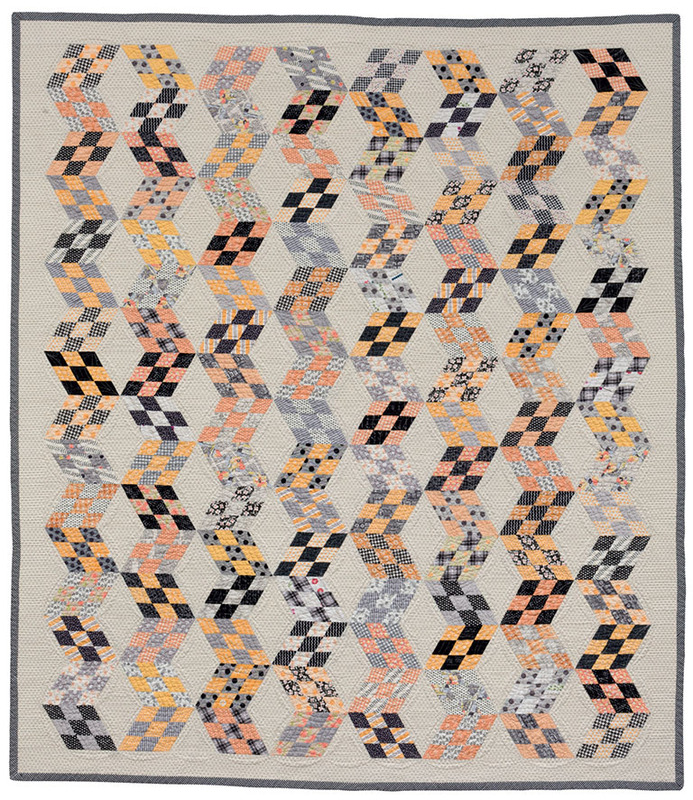 Robert, my quilt piecers, the grankids, were all holding their breath in anticipation of the World Series in the fall. It was baseball fever everywhere! Happily, the Royals went on to win the championship. 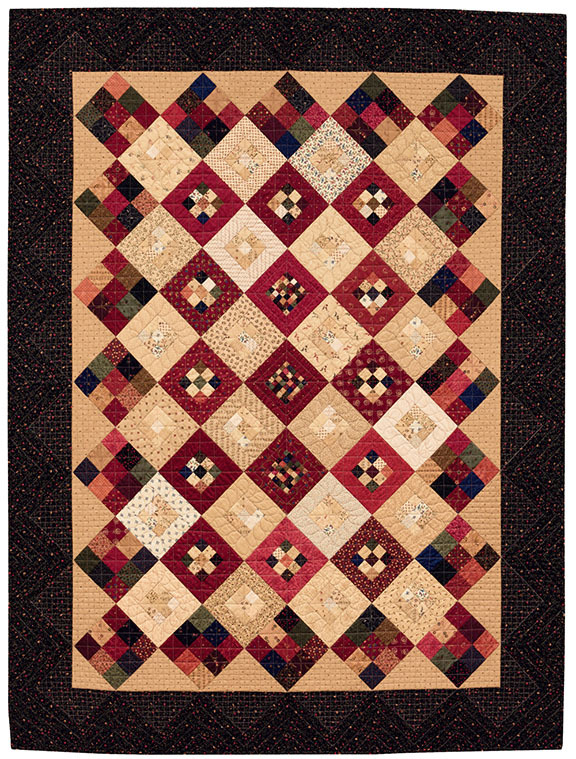 My quilt celebrates the elusive triple play in baseball with 3 sizes of 9-patches in lights and darks. Strategically placed red squares in the large 9-patches create a path around the bases surrounding nine red-framed 9-patches for the game's 9 innings. The three blocks in the center represent three strikes and you're out. Great concept! Honestly, though, alot of that was coincidence since I'm not much of a professional sports fan and just liked the color and layout, but we can play on our local team's victory anyway. 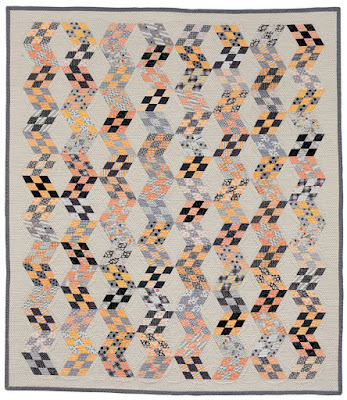 No matter the outcome of the game, I think this quilt is a home run! 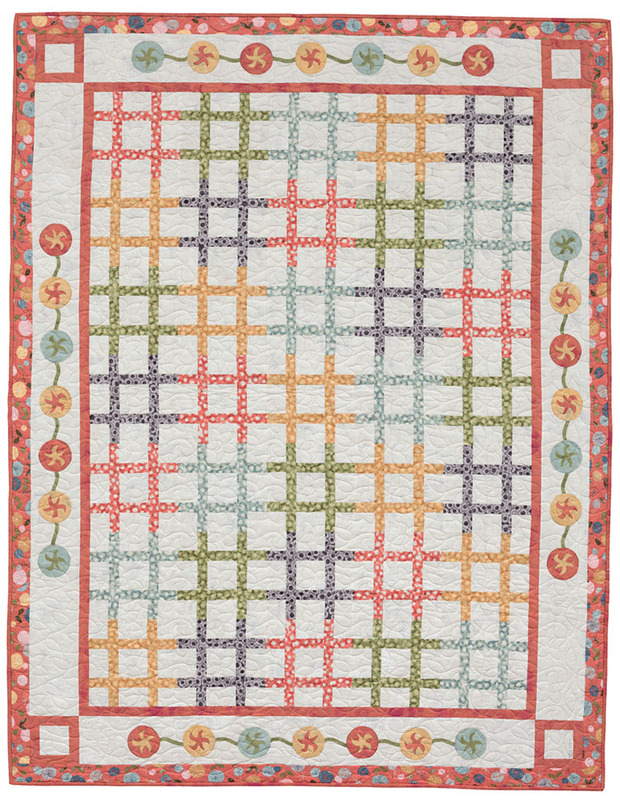 Tammy's classic 9-patch looks like a treasured antique quilt. Comment this week to win the book, I Love 9-Patches, as soon as it arrives! Nan Martino - Happy "Birthweek" Lynn! I spent the 4th working on a scrappy star quilt, using KT fabric of course. Bees In Bloom is my NEW favorite! Thanks to everyone for your warm birthday wishes. I hope you're keeping cool and able to spend some time doing all of your favorite things this summer. Robert has been working hard to update our website with all the newest KT products. He would probably be further along if I didn't keep adding to his list. (I'd hate for him to run out of things to do.) 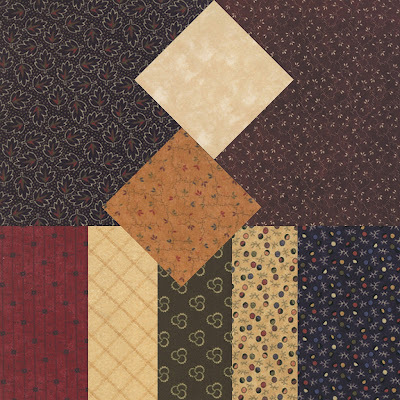 We've added 2 new categories - Lynne's Favorite Notions and Kansas Troubles Fabrics. The notions group includes our new KT Aurifil thread box and single spools of thread, Sewline glue pens & refills, Olfa pinking, wave and scallop blades and Phillips Fiber Art Cut-a-Round rulers. Aurifil Thread - If you follow my blog, you've heard me sing the praises of Aurifil 50wt. thread. 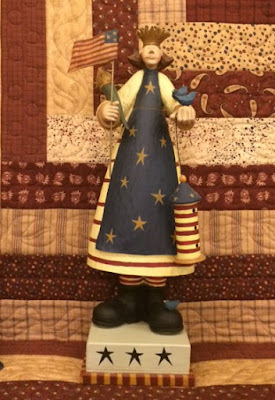 I use it for my layered patchwork technique, raw edge applique and piecing. It's fine, strong and I love my new box of KT colors that blend beautifully with my fabrics. It's like opening a new box of crayons at the beginning of the school year! Cut A Round Rulers - Do you ever need to cut a perfect circle? I have a series of 17" round table toppers we call Mini Table Treats. All of them start with a 17" background circle with a smaller circle layered on top. These rulers cut them in no time at all. Here are a few but we have more than a dozen Mini Table Treats patterns on the website. 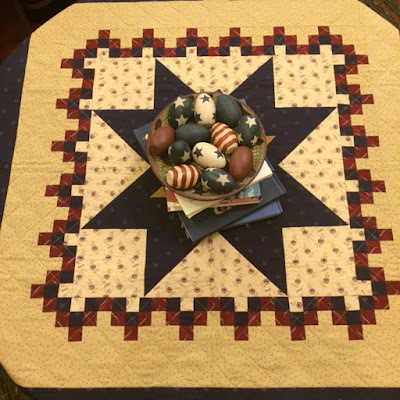 Simply fold a fat quarter into fourths, place the ruler on the folded edges and cut a quarter circle. When opened, it's a perfect circle! I love that! Totally worth it if you use circles. There are several sizes. I like the medium and large sizes. 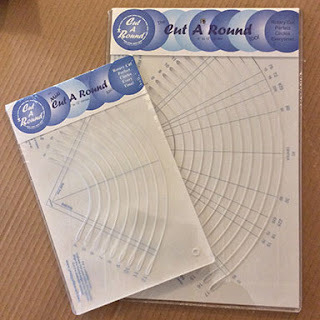 They cover about anything I need, although I'm thinking I might need the small Cut A Round that cuts circles as small as 2". Wool pennies, anyone??? 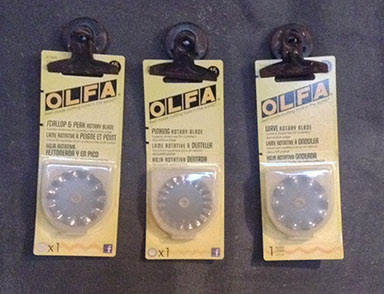 Olfa Blades - I use alot of precuts in my layered patchwork projects that require pinked edges. When I don't have quite enough precut charm squares or Jelly Roll strips, I reach for my Pinking blade and cut my own. 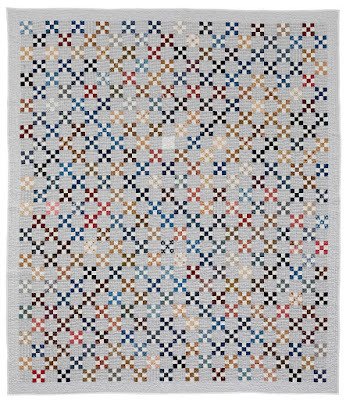 It's a bit larger pinked edge than Moda's factory precuts, but once you mix them all together and wash your quilt, there's little difference in appearance. The Scallop and Wave blades make a larger pinked edge and are adorable on kids projects or for a decorative look. 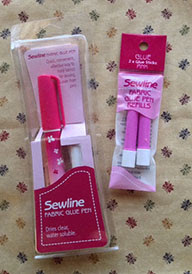 Sewline Glue Pen & Refill - I use this glue pen on a daily basis. I prefer adding a dot of glue to a couple points of my triangles for layered patchwork instead of pins. The layered piece does not scooch and you don't have to worry about removing pins (or breaking a needle). This is the best quality fabric glue I've found. It sticks much like a Post-It note, is repositionable and washes out easily. It doesn't leave a stiff spot on your quilt and, most importantly, has no harsh chemicals to damage your fabric over time like ordinary school glue. Kansas Troubles Fabric. - Over the years, we've had many requests to offer KT yardage online. 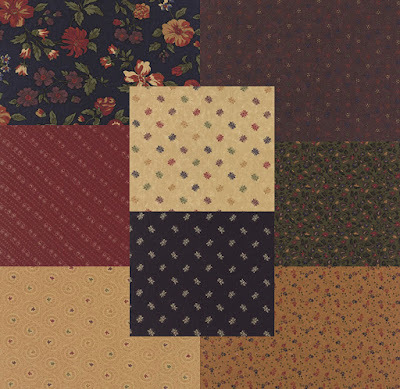 Now, you can purchase Bees 'n Blooms, Prairie Cactus and Cozy Cottage Flannels by the 1/2 yard. 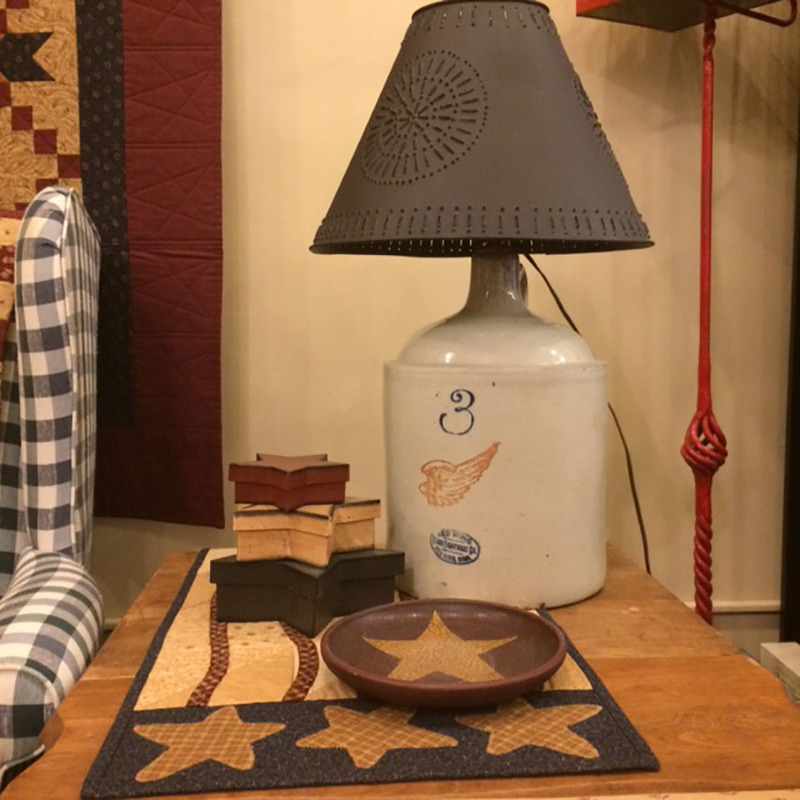 (If you purchase multiple 1/2 yd. 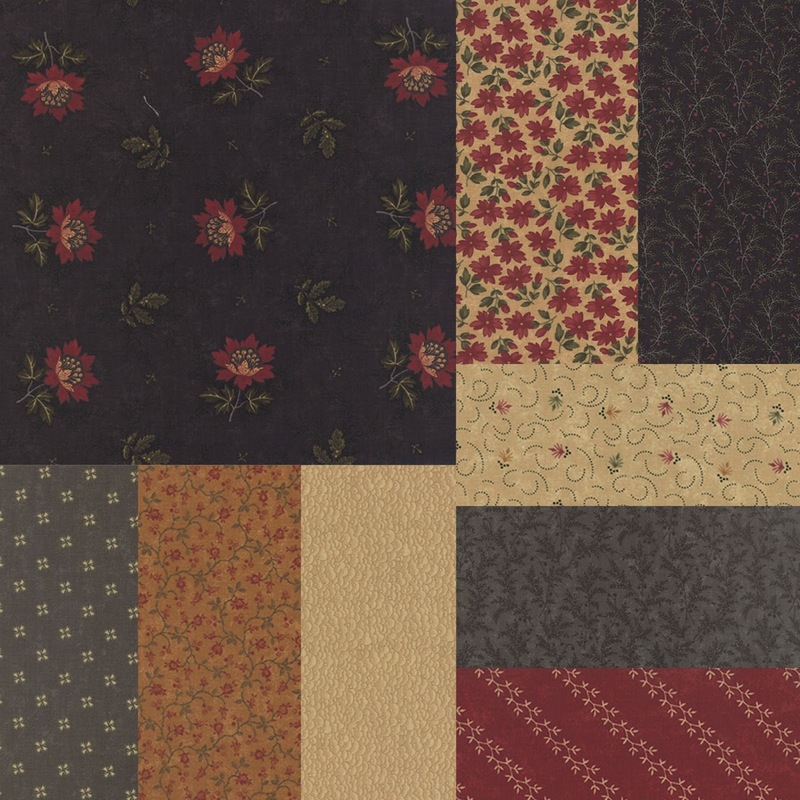 cuts of the same fabric, we'll send a full piece.) Our fabric is $10.50/yd. everyday for cotton, $12.00/yd. for flannel. Quantites are limited. Comment this week to win one of my favorite notions - a Sewline glue pen. Joanne Alburger -You are very blessed to have family time away to renew and restore, Would sew love to be lucky winner of your fence kit. Luv all you share and inspire! You're this weeks winner of our KT Picket Fence RowxRow pattern/kit. Please email us at lynne@ktquilts.com with your address and we'll send it right out. 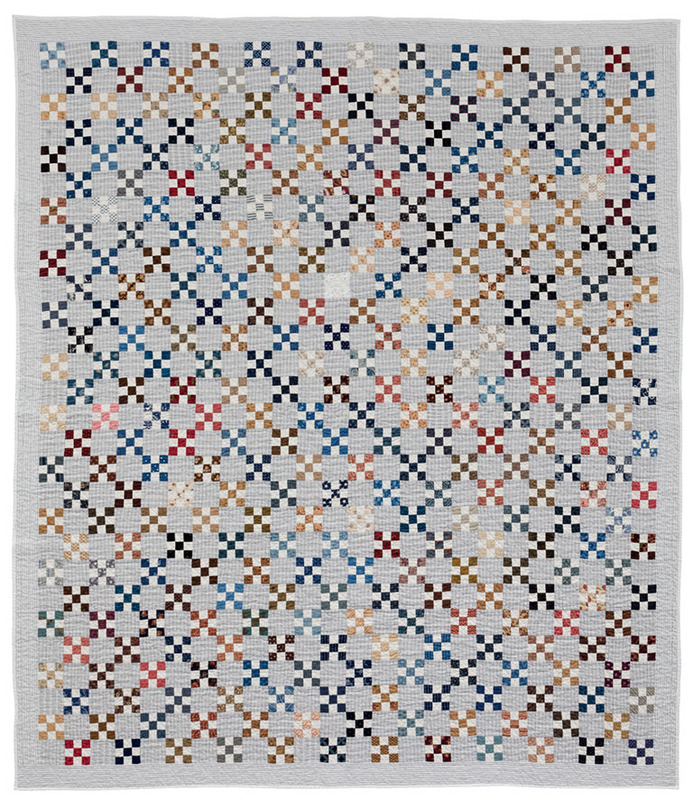 Stop by KTQ to pick up your RowxRow kit and/or free pattern thru the summer. Number two was finishing the chalk board in my studio. Once upon a time, my studio space was part of the original screened-in porch that spanned the whole front of the cabin. 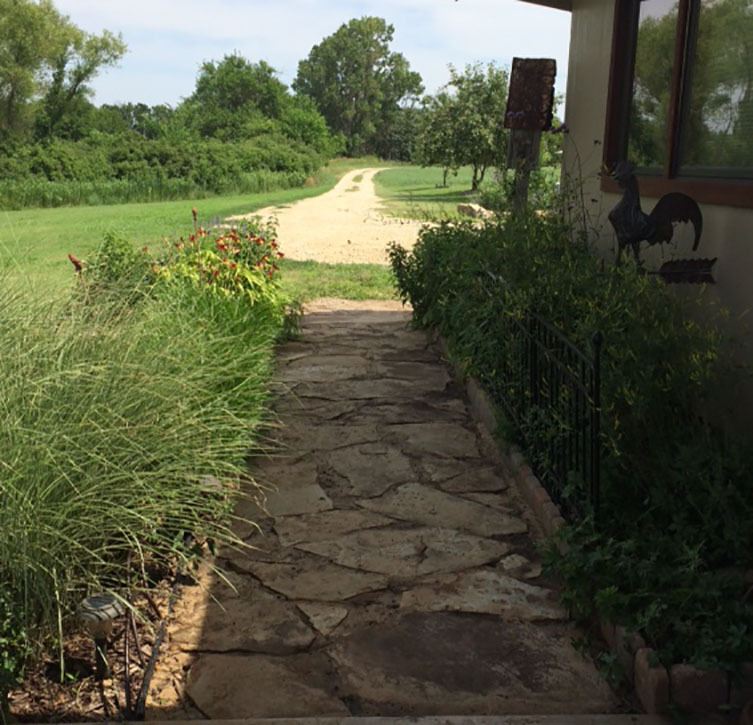 We loved spending time out there, but often had to clean the dust & dirt from the south 40 off the furniture before we could enjoy it. After enclosing half of it for my studio for year round use, we installed a window for air circulation opening onto the remaining porch. Weeeelllll.... after finally knocking out a wall and enclosing the other part of the porch as part of the house last year, I had an odd hole in my wall from an unneeded window. I decided to make the best of it and add a chalkboard/inspiration wall. Dad dug around and found a large metal display piece that fit perfectly. 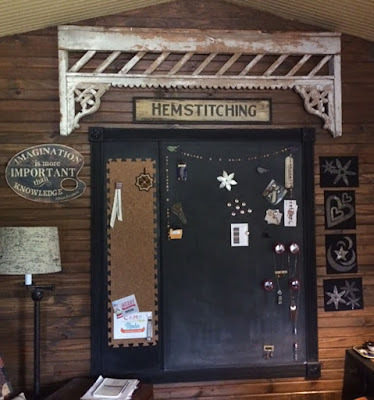 A little lot of chalkboard paint and trim and "Ta-da!". I don't have all my stuff up yet, but I have plenty of room for inspiration now. Number three on the list was changing out the decor upstairs in the retreat space from spring bunnies and flowers to all things red, white & blue. Here are a couple of pictures celebrating summer. Since it's my birthday today, I have a lunch date so I'll make this short. Here's wishing all of you a happy summer of stitching. 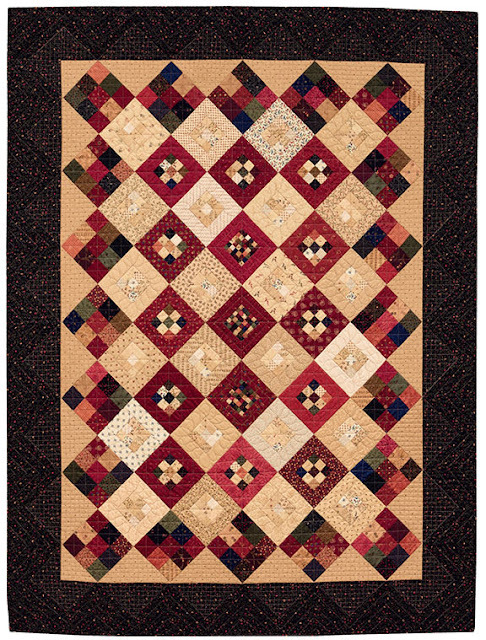 I hope to work on a patriotic quilt just for me. 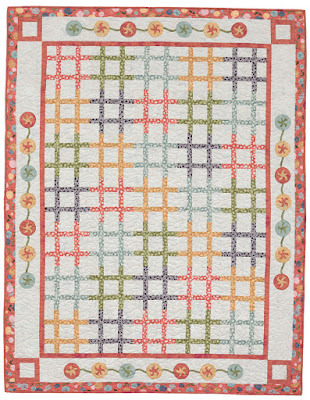 What are your quilting plans for the summer? Comment here to win a six pack of red/tan/navy fat quarters for your summer holiday sewing. See you next week!